Home / Polymer Clay / Creative Prompts / Sea Green Polymer Clay Color Recipe for Premo! 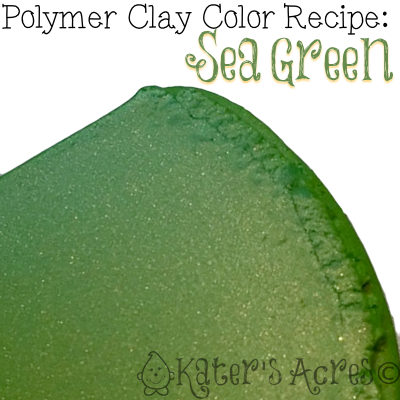 Sea Green Polymer Clay Color Recipe for Premo! Sea green polymer clay color recipe for Premo polymer clay is a bright sparkling green with a touch of metallic glitter. It’s bright, it’s vivid, and you’ll instantly fall in love! I sincerely hope that you’ve been enjoying the new color recipes I’ve been bringing you every week. Experimenting with color is something I love. It’s always something that helps to get me out of a rut, but also to open new creative pathways. I’ve also been doing this to try and help you to see that discovering and finding new colors to play with isn’t as hard as you might think. If you haven’t read my recent article on Making a Color Palette 101, it’s an article you won’t want to miss. Be sure you don’t miss last week’s Purple Dusk. Add 2-4 parts additional Wasabi for a more yellow green. Add 2-4 parts additional Green for a more “green” color. *Note that the green is deeply saturated and will quickly over power this blend. Add 2 parts additional Gold for more metallic shimmer. Previous post: What’s Going on at KatersAcres? I love that color and see it with a sand in the mixture. I am not sure what kind of sand to buy – brand please. Do you mean adding sand to the clay? Any kind of sand will work … just add it in small amounts until you are satisfied.